The Windstar Cruise Ship departs from the harbour in Monte Carlo, Monaco in Europe as it cruises out to open waters under beautiful blue skies. 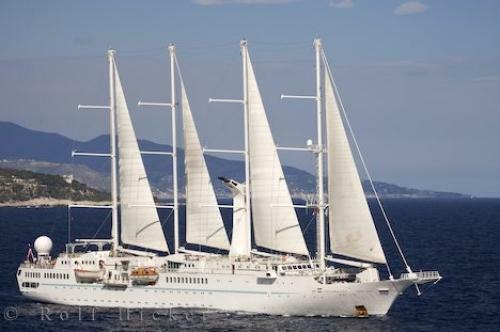 The Windstar cruise ship has many different itineraries available for tourists wanting to set sail on a first-rate yacht. Sailing on the open seas under the radiant white sails of the Windstar lets passengers see the world from a different perspective. Passengers on Windstar cruises will enjoy luxurious sleeping accommodations, superb service from all the crew and outstanding dining experiences in casual yet stylish surroundings. Cruises aboard the Windstar are one of the most romantic ways for couples to spend a vacation with a limited amount of passengers which gives you the feeling of being more solitude sailing the seas with your loved one. Activities aboard the Windstar are endless with a casino, business/internet center, bistro and bar, spa, library, pool, sports programs and a variety of other options. All staterooms and suites are furnished with an elegant decor, ocean views and all the necessities that are required while on one of the Windstar cruises. Photo of the luxury yacht known as the Windstar leaving Monte Carlo, Monaco in Europe. I photographed this photo with the digital SLR camera model Canon EOS-1Ds Mark II, aperture of f/7.1, exposure time of 1/320 sec. on ISO 100, as always I used a original Canon Lens, the focus lenght for this picture was 170mm.